There’s something special about holding a photograph in your hands. It connects you physically to a time, a place, and a feeling—an experience that an image on a screen simply can’t replicate. Of course, digital files are beautiful and certainly have their place. But a print or custom album are tangible heirlooms you’ll pass down for generations, providing a connection to your wedding day that you and your family will cherish for years to come. A museum quality art book - the custom-designed book features approximately 120 images over 45 spreads. The quality of the book itself is unparalleled, printed on thick archival matte paper and bound in your choice of leather, cloth, and embossing styles. Printed with archival ink on fine art paper - a museum quality art book - each spread is 20 mil (.5 mm) thick. Choose from linen, silks, leather & vegan leather covers. Our high quality Book Cloth is durable and comes in a wide variety of colors. It’s also incredibly versatile. When paired with custom designed embossing, Book Cloth can range from casual to elegant, silly to serious. You will see the cloth fabric swatches listed as coated or uncoated. Uncoated is a more natural finish, usually softer. While coated is aqueous coated to protect against stains and spills. Café Leather delivers the rich statement of leather in soft and familiar tones. When you need something a little more special but still friendly and casual, Café Leather is the perfect solution. Bonded Leather, top coated for finish. With more ‘aggressive’ textures - Rustic Leather is a blend of luxury and rural charm. This is a soft leather so it will show ‘rustic’ marks and does show scratches easily - which adds to the rustic / worn feel over time. Bonded leather, top coated for finish and stamped for texture. A stamp (a design) into the surface of an object so that it is indented. 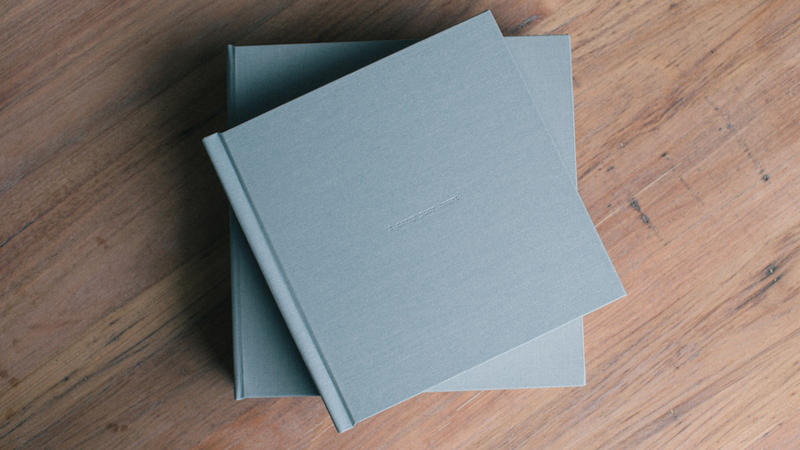 Our hardcover book features fine art press papers hand bound into a fabric cover of your choice. This is the perfect option if you would like over 150+ images in your book design. These pages are thinner than the fine art book option - similar to what you see in a bookstore & spreads do not lay flat. Personalize your hardcover book with classic, blind debossing and we also offer foil debossing exclusively for use with our luxe covers. Color options include gold, silver, and rose gold. Some of my favorite fonts are below but you are also welcome to send me your own font or PDF of your wedding stationary and I can incorporate it into the design. Step 1 : Decide if you would prefer the fine art book (maximum 150 images) OR the hard cover book option (300+ images - you can submit as many as you want & i’ll try make it all work in the design). Step 2 : You submit your favorite images using your proofing gallery (there is a love heart symbol to select favorites) OR let me do the initial design based off my favorites of the day - curious to know which my favorites are? They are the ones included in the slideshow. If you are having a hard time making a selection, even send me your top 30 must haves and I can take care of the rest of the selection. Once I get the go ahead to start the design, I will design a first draft and upload it online for you to review. Step 3 : You view the draft and are welcome to request any design changes. We can go back & forth on the draft 3 times making changes. After 3 rounds of changes there will be an additional fee of $100 per set. (but I've never had to charge this as everything always looks great after 1-2 changes). Step 4 : Approval - once all approved, I send you through a final draft to sign off on - you review and sign off on it to say it’s ready for print. Once I get back this back, I order the album. Step 5 : The book takes about 4 weeks to make - all hand made by book binders in the USA, it will then be sent to me where I will check over it and make sure it’s perfect before I send it out to you. Although it’s important to have an overall sense of narrative, when illustrating the story of your wedding day, don’t feel like you need to include every single event/moment/person. Group photographs are mostly for family history purposes. You don’t need every single combination we took on the day in the book. One nice photograph of the whole family–perhaps on each side is all you really need. We like to be able to show who came out and celebrated you two tying the knot. Years later, you’ll want to know who was there. How many images to choose? Around 120-150 is ideal if you are going with the fine art book option so the design does not end up too cluttered. If you cannot get it down to that number, I recommend you go with the hard cover book option as that can include up to 100 spreads, more than double of the fine art book. For the hard cover, you can submit as many images as you want and I will try work them into the design, but as an absolute maximum, I would say 500. How do I submit the images? The best way to select the images is to log in on to your gallery of the proofing site at: http://galleries.sammblakeweddings.com - In your gallery you can pick your selection by adding each image to your favorites by using the "Favorite" button / love heart symbol icon. Once you have made the final selection, email me saying you are complete and I can login to see your list and start the design. I've submitted my favorites - what's next? Once I receive your favorite selection, we will start designing your book! We will do a draft layout to what I think looks good and tells the story of the day. Once this has been completed, I will upload the layout online and send you information to log in and view. Once you have received the login information to view your draft layout online, you will be able to make comments directly onto the website about any changes you would like made. This is the best time to be honest, if you don’t like the page at all, tell us so! Don’t worry we will not be offended if you don’t like it! :) You can come and go from this website as you please, your comments will be saved until you are ready to submit them. Once you submit your comments, we will then make all the necessary alterations. Re-upload your new layout and let you know so you can add your comments again. You get three opportunities to make changes. After that, each set of changes will cost $100. Once the book design has been approved by you, I will send you a PDF proof to sign off on. Once that has been completed, I place the order for the book and it will take approximately 4-6 weeks (but can be up to 12 weeks in peak season) before it gets shipped back to me. Once I receive the book, I will double check that it all looks amazing and send it out to you. From start to finish, the whole process should take around 8 weeks or less. If you are having trouble picking out favorites or life is just too busy to sit down to do it, I can always select the images for the book design (you will have the option to make changes obviously) Just let me know if you prefer this option. Please use the below form to let me know what options you would like to go with! Please look at the swatches above for the cover options. Due to the books being made by different book binders, only the fine art books swatches (the left side) can be used on the fine art books & the hard cover book swatches (the right side) on the hard cover books.